Liftoff of the Progress craft occurred at 10:45 p.m. EST from the Baikonur Cosmodrome in Kazakhstan, beginning a nine-minute ascent for the liquid-fueled rocket. The preliminary orbit was achieved and onboard commands then extended the Progress craft's two power-generating solar arrays that span 35 feet and unfurled communications and navigation antennas. A series of precise engine firings over the next two days will guide the Progress toward its automated rendezvous with the station. The docking is planned to occur Thursday at 11:26 p.m. EST. The 24-foot long ship will attach itself to the aft port of the Zvezda service module. 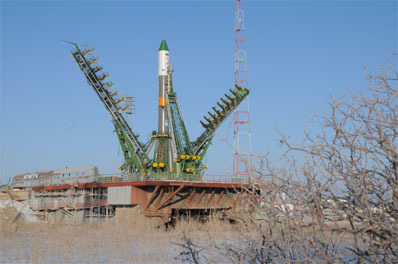 Tuesday's launch was known in the station's assembly matrix as Progress mission 36P. The spacecraft's formal Russian designation is Progress M-04M. The Russian-made craft will deliver two-and-a-half tons of supplies to the station. The "dry" cargo tucked aboard the Progress amounts to 2,683 pounds in the form of spare parts, life support gear and equipment hardware. The refueling module carries 1,940 pounds of propellant for transfer into the Russian segment of the complex to feed the station's maneuvering thrusters. The vessel also has 926 pounds of water and 106 pounds of oxygen and air. The space station is staffed by the Expedition 22 crew of commander Jeff Williams, fellow NASA astronaut T.J. Creamer, Russian cosmonauts Maxim Suraev and Oleg Kotov and Japanese astronaut Soichi Noguchi. Suraev and Kotov will be standing by Thursday night to take over manual control of the approaching Progress spacecraft if the autopilot experiences a problem. They spent time earlier Tuesday checking out the backup system. After the Progress arrives, the station crew will turn its focus to the upcoming space shuttle construction mission. Endeavour is scheduled to launch from Kennedy Space Center in Florida on Sunday at 4:39 a.m. EST. The shuttle will dock with the station on Tuesday to deliver the Tranquility module and cupola observation post. You can follow along with Endeavour's launch countdown and flight in our Mission Status Center.